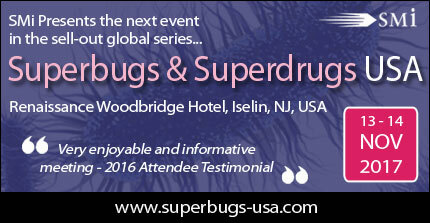 Kathy Talkington, Project Director from Pew Charitable Trusts, will discuss the “Shared Platform for Antibiotic Research and Knowledge” when she presents a keynote on “SPARKing” new antibiotic drug discovery at SMi’s 20th annual conference on Superbugs and Superdrugs next March in Central London. With a background in managing and developing immunization and infectious disease programs and policies, Kathy Talkington is currently responsible for Pew’s work on antibiotics. Pew seeks to address the growing threat of antibiotic resistance by spurring the innovation of new antibiotics and ensuring the appropriate use of antibiotics in both human health care settings and in animals. “SPARK” is a ground breaking and dynamic platform that brings together antibiotic discovery data and cutting-edge analytics to help scientists tackle the scientific barriers blocking antibiotic discovery. While the global threat of antibiotic resistance continues to rise, nearly every antibiotic in use today is based on a discovery from more than 30 years ago. SPARK will focus on the unique challenges of finding and designing antibiotics that can defeat drug-resistant Gram-negative bacteria, which are among the hardest-to-treat superbugs. SMi’s 20th Annual conference on Superbugs & Superdrugs will take place on 19th & 20th March 2018 at the Copthorne Tara Hotel, Kensington in London, UK.